Among other changes, the advent of the iPod has caused many people to adjust their ideas about where music should be listened to. While at one time we moved to a specific location to listen to music—the living room in front of the family stereo, for example—we now expect to be able to listen to music wherever we are. And in a home larger than a studio- or one-bedroom apartment, that can mean bedrooms, living room, kitchen, and outside areas. Companies such as Sonos cater to this expectation by selling multi-room music systems that allows you to easily control and play music piped throughout your home. CasaTools has jumped into this market with its CasaTunes XLi ($2600) and XLe ($4000) music servers. These are low-profile PCs outfitted with CasaTools’ CasaTunes 6- and 12-channel audio cards, respectively. 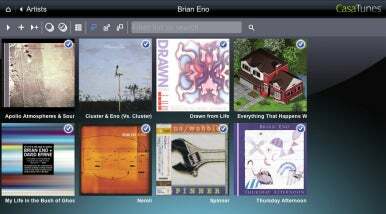 Each runs the Windows 7 Home Premium OS and the company’s CasaTunes music server software. Using that software, you can send music from six separate sources (five internal libraries as well as one external device) to up to six sets of speakers. The XLi does not contain an amplifier so you either have to send its output to powered speakers or attach it to a multi-channel amplifier such as CasaTools’ $1250 XLa V2 12-channel amp for use with unpowered speakers. Although they achieve the same ends, Sonos and CasaTunes are largely designed for two different markets. Sonos, with its wireless mesh network, is ideal for those people who don’t want to (or can’t) run wires to create a multi-room music system. Just purchase a Sonos unit, place it in the room you want to add music to, and add it to the system. CasaTunes, with its need to run wires, is better suited for those homes and businesses that have built-in wall and ceiling speakers. Similar to Sonos, using the CasaTunes software you can mix and match sources and speakers as you like—play different music on each set of speakers—and configure the system directly from the PC, from a Web browser on another computer (yes, from your Mac too), or from the free CasaTunes app. I tested the XLi model, which is powered by an AMD 2.9GHz Athlon II 2x processor, and includes 2GB of RAM and a 1TB hard drive. The XLi additionally houses a memory card reader for CF, SD, MMC, SM, and Memory Stick media and an 8x DVD+/-RW drive. It also includes gigabit ethernet, multiple audio connectors (including 7.1 audio out), line in, microphone, headphones, and S/PDIF digital audio out); VGA, DVI, and HDMI video outputs; six USB ports; and two FireWire ports. Lest this sound like a review of a Windows PC (which, traditionally, doesn’t go over terribly well with Macworld readers), let me explain that although you must spend some time with Windows and the CasaTunes setup software in order to configure the XLi, you should have very little contact with it afterwards. Setup involves attaching the server to a monitor using the DVI or VGA video outputs or TV (via HDMI), plugging in an input device such as a mouse and keyboard, and telling the server setup application where to find your music. You can optionally disable Windows Media Player and ask the server to play music from your iTunes library as well as use iTunes to rip any CDs you place in the server’s drive. You also create zones (groups of rooms) within the setup application. And you can ask the server to access music from a shared device or NAS (though configuring it to do so isn't intuitive). Once you’ve completed setup, you should have to return to Windows only when you want to modify zones, as this can’t be done remotely or via the CasaTunes iOS app. At this point you can unplug the monitor and keyboard and leave the server running. If you want to copy music from your networked Mac’s iTunes library to the CasaTunes server, you download a copy of the company’s free CasaTunesSync application. Run CasaTunesSync and all of the compatible music files in your iTunes library (meaning DRM-free music files) as well as selected playlists are copied to the server. When I first attempted to do this with a library of more than 30,000 tracks, I met with failure. Neither the tracks nor playlists copied to the server. The company has since updated the Mac version of the CasaTunesSync application and it now works reliably. When I first started using the server there was no option for copying just a portion of your compatible music—it was all or nothing. Thankfully, the software has been updated so you can now choose just selected playlists. This is an improvement, but it still doesn't provide the kind of syncing flexibility offered by iTunes, where you can import specific albums, artists, songs, and genres. You can additionally play and control music on an attached iPhone, iPod touch, or iPad so that’s another option for attaching just a portion of your music collection. As I mentioned, you control the XLi via a Web browser or the iPhone/iPod touch app (currently there isn’t an iPad app). The browser implementation gives you a good idea of how the server works. 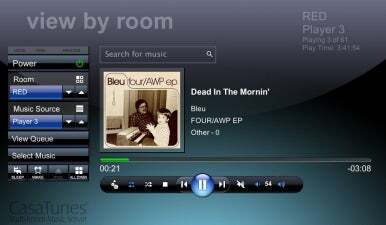 On the home screen within your Web browser you find Power, Room, Music Source, View Queue, and Select Music entries along the left side of the window. Below are transport controls as well as repeat, shuffle, mute, and volume controls. Planted in the center of the window is now playing information including the track name, artist, and album. A timeline appears below indicating where you are in the playing track. Above the now playing area is a search field for searching music. To choose a room, just use arrow buttons to move from one room to the next. (A pop-up menu would be more convenient but, alas, there isn’t one.) Similarly, you use arrow buttons next to the music source entry to switch music sources—one of the five internal music sources or an external source such as an iPod touch, iPad, or iPhone plugged in via a USB input. You can switch sources by clicking the Select Music button and then selecting a source from the list that appears. This list includes music stored on the server in your iTunes and Windows Media libraries, RadioTime and Shoutcast Internet streaming broadcasts, an attached external device, music you’ve stored with MP3.com (account required), and any CasaTunes playlists you’ve created. Unfortunately, CasaTunes doesn’t currently support Pandora or subscription music services such as Rhapsody, Napster, Spotify, Rdio, or Mog. There are also Sleep and Wake buttons within this screen for automatically switching off the music after a certain period of time and switching on the music at a specific time, respectively. If you’d like to see what all your sources and players are doing, click the All Zones button. Regrettably, this screen doesn’t tell you the music each zone or player is playing. Rather, you see the source’s name, which you assign in the setup application—Biff’s Music, Classical, Moody, and Janie’s Tunes, for example. While descriptively named sources are helpful, more helpful would be able to see exactly what’s playing in each room in this view. The free CasaTunes app is the portable (and more powerful) way to control the server. It’s laid out somewhat similarly to the Web browser. You can view all the rooms on a single screen and choose which you want to channel music to by tapping power buttons next to each room entry. To view what a particular room is playing, tap the room and you’re taken to a Now Playing screen where you find transport controls. 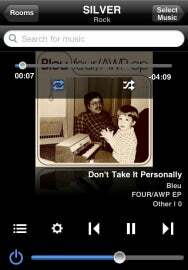 If nothing is playing tap a Select Music button to see a list of music sources and what’s currently queued up on them. Tap the Change button next to a source to choose your music (again, from a library, RadioTime, Shoutcast, playlist, or MP3.com). When music is playing you can tap the screen and find controls for repeating and shuffling the currently playing playlist. In this area you can also scrub back or forward in the track. A Search field appears on the top of the screen that you can use to find artists, albums, or tracks available to the server. Tap a Queue button and you see the currently selected queue. Tap Edit in this screen and you can rearrange the order of tracks as well as delete those tracks you don’t want to hear. You can also choose to save the songs in the queue as a playlist. If you’d like to configure the settings for each room, return to the Rooms screen, tap the right-pointing arrow next to a room entry, and in the resulting screen for that room you can configure the room’s name, picture, volume, balance, bass and treble levels, sleep and alarm features, and switch on a DND (Do Not Disturb) feature—a feature that, when engaged, keeps a room from being affected by changes to a zone. For instance, if Kitchen, Living Room, and Bedroom are part of a zone and the person controlling that zone chooses to blast Megadeth throughout the house, the person shocked out of bed can turn on DND for the bedroom and listen to something else (or, better yet, nothing at all). You can also create and save zones using the iOS app. Creating zones isn’t an entirely intuitive process, but the ability to create and save multiple zone configurations is nice. The CasaTunes server does exactly what it’s supposed to do. It channels music from a variety of source to the outputs you’ve configured with the server software. The server was responsive and the music coming out of the audio card sounded quite good on the headphones and speakers I tried it with. The current implementation is a good start, but I'd like to see it reach out across the Internet. Having support for Pandora is close to a requirement for Internet-capable music systems. And while subscription services such as Rhapsody and Napster are less popular than Pandora, offering a couple of them would be a good idea. CasaTunes’ browser interface is functional, but a little clumsy—for example, having to use the arrow buttons to move through sources rather than a pop-up menu and the inability to see what’s playing in each room while viewing all sources. The iOS app is the far better way to go as it not only lets you control your music from anywhere in the house, but it’s reasonably easy to work your way around the interface. That said, a version created specifically for the iPad that puts more controls on a single screen would be welcome. Feeding a house full of built-in speakers is not a problem a lot of us face. CasaTunes’ solution isn’t bad, but with its inability to stream popular Internet media, it’s currently limited. The good news is that, as a computer-based system, CasaTunes can grow and adapt as software is updated and content deals are made. In the meantime, if you don’t mind a little work with Windows, have the budget to support a $2600-or-more music server, and have little desire for music streamed over the Internet, the CasaTunes XLi and XLe servers may interest you. Updated 4/20/11 to address update that allows you to copy individual playlists and correct information about streaming from shared devices.